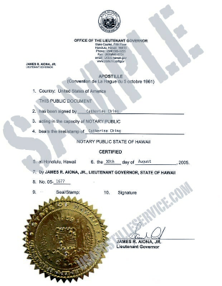 Apostilles certify only that a document has been signed by, and bears the seal and stamp of, a duly commissioned Notary Public of the State of Hawaii. 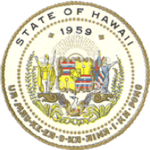 An Apostille does not validate the substance, contents, and/or legal effect of the document, nor that the document has been approved and/or endorsed by the Lieutenant Governor, the State of Hawaii, or any court of competent jurisdiction. Persons born, married or divorced in the State of Hawaii, must request a certified copy that displays the ORIGINAL SIGNATURE (not a stamped signature) from the State Registrar of the Department of Health. Birth Certificates and Marriage Certificates can only be issued by the Department of Health, Vital Records. General documents must be notarized by a duly commissioned Notary Public of the State of Hawaii.